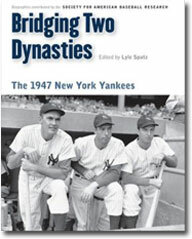 The 1947 Yankees always seemed to stand “alone” to me among the litany of champion Yankee clubs—neither a Joe McCarthy team, nor a Casey Stengel team, carrying over some wartime players and introducing some guys that, frankly, didn’t feel like Yankees. I mean, what were George McQuinn—a St. Louis Brownie!, Bobo Newsom—who played everywhere!, and Aaron Robinson—a catcher who was neither Dickey nor Berra—doing in Yankee pinstripes? And for that matter, what was Bucky Harris doing managing the Yankees? As Larry MacPhail was remaking the team following his purchase of the club in 1945 (with Dan Topping and Del Webb), this made little sense. Harris was a career American Leaguer with little connection to MacPhail, and even less a connection to the Yanks. This was the man who would manage the team? You thought of Harris, and you thought of the Senators. The Yankees? It all seemed so strange. McQuinn, for example, was best known for holding down first base for the pennant-winning Browns in 1944—their only pennant— but even then, he was a .250 hitter of rather pedestrian skills. Newsom! Don’t get me started! He had this clownish nickname and he was so un-Yankee, having started playing pro ball in 1928 and pitching for Brooklyn, the Cubs, the Browns, the Senators, the Red Sox, the Browns again, the Tigers, the Senators again, the Dodgers again, the Browns again, the Senators again, the Athletics, and the Senators again, before waking up and finding himself in baseball heaven, the Yankees. He’d lost 20 games three times. This was not a classic Yankee pickup. And yet, there was Bobo, 39, taking the mound as a starting pitcher in his baggy grey New York uniform, starting Game Three of the 1947 World Series in Ebbets Field, the park where he had broken in at age 20. His teammates then included Dazzy Vance, Davey Bancroft and Max Carey, and his manager was Wilbert Robinson, who broke in in 1885! He had more than 5,000 professional innings under his belt, and there he was—a Yankee starting pitcher in a World Series, surrounded by Joe DiMaggio, Tommy Henrich and Phil Rizzuto. This would be the game in which Yogi Berra, pinch-hitting for Sherm Lollar, lofted a pinch-hit home run in the seventh inning off Ralph Branca, which would, incredibly, be the first pinch-hit home run in World Series history. Yes, there was something very interesting about this team. There was Snuffy Stirnweiss at second base, a chance to prove he was not just a “wartime” player, as he paired with Rizzuto to form an excellent double play combination. And there were Allie Reynolds and Vic Raschi, not quite the Reynolds-Raschi-Lopat trio who would prove so dominant in coming years, but enjoying their first year as teammates, and picking up World Series rings in the process. Reynolds came from Cleveland for Joe Gordon and won 19, while Raschi, home grown and signed by Lou Gehrig’s scout, Paul Kritchell, came up from Newark in July and went 7-2. Fireman Joe Page was a special figure in 1947, a relief pitcher before there was glamour to the role, winning 14 and saving 17 (although we didn’t know the word “save” back then), and Joe enjoyed the good life, perhaps more than he should have. But to be young and a Yankee and to hang out with Joe DiMaggio— life was good. Fans were still basking in the post-war era of good feelings, packing major league ballparks, and enjoying the return of the “real guys” after enduring years of 4-F players. DiMaggio, who had hit just .290 in 1946, needed to prove that he was still Joe D., and he did, with his third MVP award. He got out of the gate quickly and peaked at .368 on June 3. Now 32, there certainly loomed large questions over whether his skills were gone. Everyone—Yankee fans or not—breathed a collective sigh of relief when it looked like indeed, his game had returned. Given little chance to displace the powerful defending champion Boston Red Sox, this blend of veterans—along with rookies like Frank Shea, Yogi Berra, and Bobby Brown—compiled a record-tying 19-game winning streak as they romped to the American League pennant. They then defeated the Brooklyn Dodgers in a classic seven-game World Series that included two of the most memorable incidents in Series history—both at the expense of the Yankees. Bucky Harris deserved a better fate. With MacPhail gone in ’48 after one too many drinks and one too many punches at the World Series celebration party in ’47, Harris could not survive finishing 2 1/2 games behind the following year, despite winning 94 games. Had he been spared, as good logic suggests, he might have been the man to win five straight world championships starting in 1949, as Casey Stengel did. And then we’d be speaking of Harris in the opening paragraph when we write of the greatest managers in history. Yes, the ’47 Yanks were the team that didn’t quite connect with the team’s past, but one that made its fans feel terrific—the war was over, and the Bronx Bombers were back on top. Real life had officially returned.